Journey mapping is just a tool. Nope, it's not just a tool; it's not just a workshop: it's a process. Journey mapping is a creative and collaborative process that allows you to understand – and then to redesign – the customer experience. You must view it as the process that it is, otherwise there's no point in mapping. This diagram outlines the six-step journey mapping process I advocate. At a high level, here's what each of the steps entail. Plan: This first step includes all the pre-work and prep work that needs to be done in order to get ready for your journey mapping workshop, including identifying the personas for which you’ll map, outlining the scope and the objectives of the map, determining the appropriate workshop participants, and educating the participants on what lies ahead. Empathize: This is the actual current state mapping workshop, where you'll map what customers are doing, thinking, and feeling along the journey you selected in Step 1. You'll also add data and metrics into the map to help identify moments of truth and bring the map to life with artifacts (e.g., pictures, videos, documents); identify moments of truth; and assign owners to each of the customers' steps. Identify: The map alone doesn't identify moments of truth; for that, you need data - and it's one of the main reasons you need to insert data into your maps. 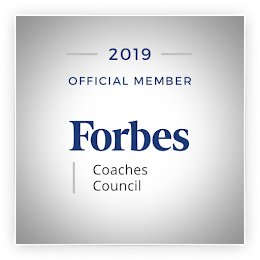 In this step, you'll prioritize moments of truth, research issues behind those broken moments, conduct root cause analysis, develop action plans, and assign owners and deadlines to the plan. 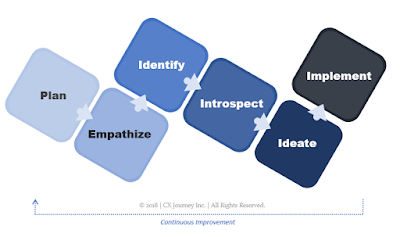 Introspect: Once you're done with the journey map, it's time to look inward and create a service blueprint, which outlines the people, tools, and systems that support and facilitate the customer experience, and a process map, which outlines the workflows that do the same, to correspond with the customer journey you’ve mapped. By linking the service blueprint to the customer's journey, you've got that end-to-end picture of the journey plus the surface to core view, giving you the complete picture of what's working and what's not. 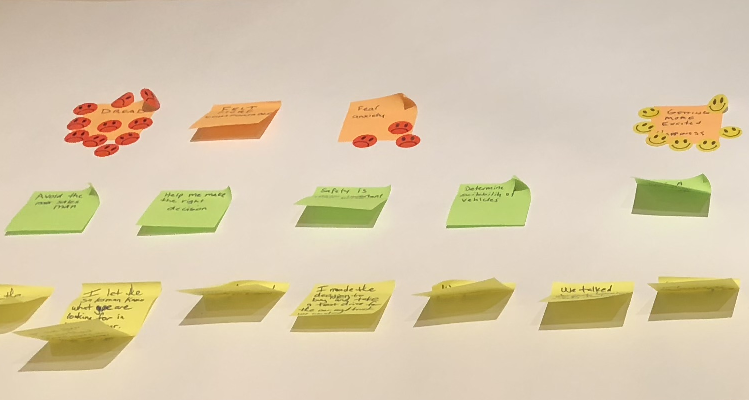 Ideate: Next up, you'll conduct future-state mapping workshops - for both the customer journey and the corresponding service blueprints - during which you'll ideate solutions to customer and backstage pain points and then design the future state. Implement: And finally, it's time to get to work, time to implement the changes. Prototype and test the new design with customers – and fail fast; fix, test, and fail fast; implement the new experience; share the maps and train employees on the updated processes and the new experience to deliver to customers; close the loop with customers and let them know what's changed; and always update the maps to reflect the new current experience. You might have thought that journey mapping was as simple as "map and done." But that couldn't be further from the truth. And that's where a lot of companies stumble with their mapping efforts. Nothing changes if nothing changes. If you don't do anything with what you learn, then stop doing it. It's a waste of everyone's time. But that's not why we're here. Instead, you need to listen, learn, understand, and do something. Remember, you can't transform something you don't understand. Now, go do it! And if you need help, I'm here. Just reach out!